Once your cart is complete you are ready to checkout. Begin the checkout process by pressing on the CHECKOUT button on the button bar. Leadiro will then calculate your cart size and present you a confirmation dialog. 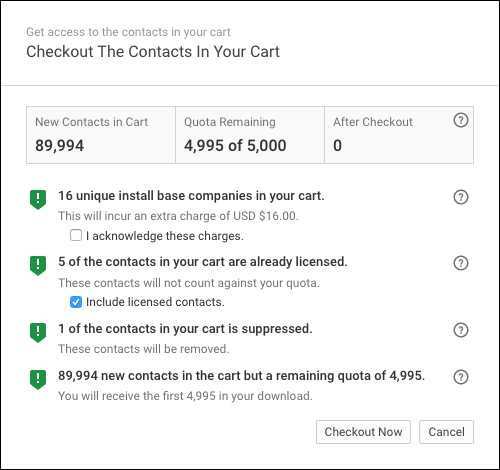 New contacts in cart - the net new contacts that are in your cart. These are contacts that are in your cart that you haven't accessed before. Quota remaining - the number of contacts you have left in your quota before this checkout. 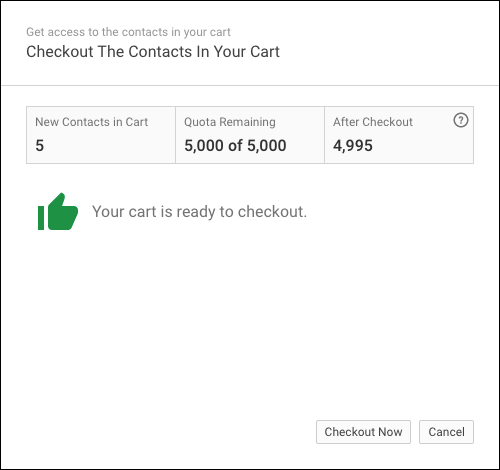 After checkout - the number of contacts that will be left in your cart once checkout has completed. To complete the checkout and get access to the contacts click on the Checkout Now button. We will generate your contacts and prepare them for download or export. You can always get access to your previous orders at any time by using the Previous Orders panel. Depending on the contents of your cart and your previous orders you may receive some special messages at checkout. Install base companies in your cart - you have added contacts into your cart that include install base data. You must confirm that you accept the additional charges for this data. Contacts in your cart already licensed - you have contacts in your cart that you or your organisation have already licensed. These won't be counted against your quota. You can choose to keep them in your cart for free or remove them on checkout. Contacts are suppressed - some of the contacts in your cart are suppressed by you or your organisation. They will be removed from your cart on checkout. Contacts in your cart but a remaining quota of - the number of contacts in your cart exceeds your remaining quota. Your cart will be trimmed down to match your quota.